Appleton Thorn by Robert Bateman, 1880. Warrington Museum. Tree of Life Necklace by Feral Strumpet. Once there was a time when we knew the trees and they knew us. They were planted in the middle of villages and were considered guardians of a place. On Old Midsummer Day, July 5th, the third Saturday in June or there abouts, these guardian trees were adorned with garlands, ribbons, flowers and flags. Appleton Thorn in Cheshire is named after such a hawthorn tree and here this tradition, called the Bawming of the Thorn, continues. The tree there is said to be an offshoot of the legendary Glastonbury thorn, a tree with its own fascinating history. Legend claims it was brought from Jerusalem to Glastonbury by Joseph of Aramathea and was the same tree from which the crown of thorns was made. Others claim this fantastic story was a creation of the monks who wished to discourage the use of the Hawthorn in pagan rituals and yet still wished use its power to promote their Christian faith. The hawthorn is the May Tree or White Thorn– with it’s beautiful white flowers juxtaposed against its sinister thorns. Washing in the dew gathered from the white petaled flowers was a Old Tyme beauty tip. Witches made their brooms from them– perhaps because the hawthorne is the gateway to the fairy realms, the Otherworld. Vivian imprisoned Merlin in a cage of Hawthorne branches, using his own spell against him and it was under a Hawthorne that the Queen of May captured Thomas the Rhymer. Hawthorns often stand guard over sacred wells– and in these manifestations in story and landscape do seem to suggest the Yggdrasil, a tree linking this world with other realms. What survives of these notions fascinates me. These happy village fetes, celebrating a tree with song and dance– is this a kind of Druidic hold over? A dream writ in Ogham on our collective subconscious? In England these ancient ideas manifest with fanfare– brass bands and Morris dancing. People still gather– they say it is for the sake of tradition– that it as has always been so, but I like to think there is something else here, feeding the imagination, talking back to our ancient guardians telling them we have not forgotten them. 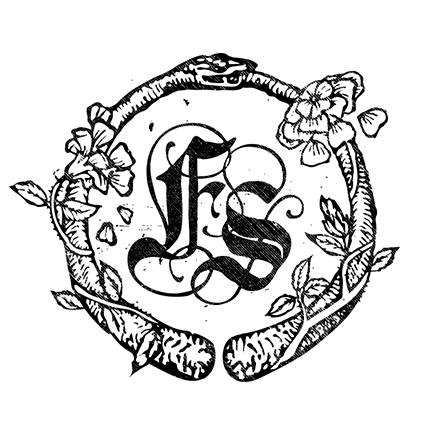 I’ve been featured in an interview up at the Folk Reveries blog! 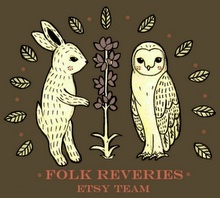 Folk Reveries is an Etsy team of artists and makers who share a common aesthetic, inspired by myth, folklore and the narratives implicit in the natural world. 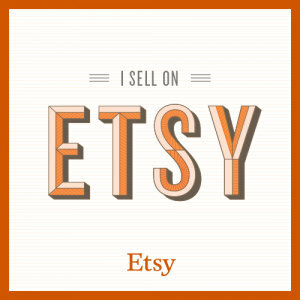 Etsy teams are groups of Etsy makers who work together to support each other’s shops, coaching, trouble shooting and inspiring each other. 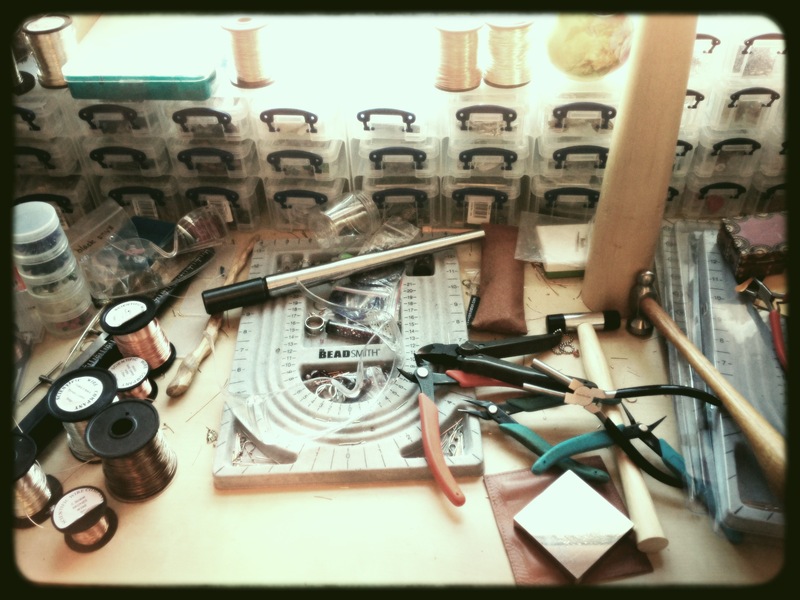 Having an online shop and being an independent artisan can sometimes feel quite isolating– many Etsy sellers create and participate in teams to find support others might have at a more traditional workplace. I am part of many teams but Folk Reveries has been the Team I have drawn the most inspiration from, and one that genuinely supports its team members. The quality of the artists and makers on this team really shows Etsy at its best. 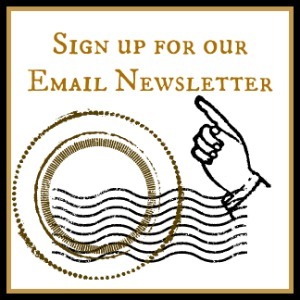 Check out the blog— you can see many other wonderful artists interviewed, with a sampling of their work! Through the Christmas rush I’ve had a kind of breakthrough. It has to do with new skills, new magic tricks. It all seems to be summed up in this humble ring– the “spiral promise”– because the wires seem to endlessly circle each other and because it reminds me of a simple love token. I made one of these for myself– which is how most of my designs begin. I thought, it’s so humble, what would it mean to anyone who regularly collects my designs? And yet I wore mine every day and came to love it. Little by little I have been introducing these new pieces that feel much more personal. When I opened the shop I was recreating the vintage pieces I had to sell off, one by one, because I could not find work in Yorkshire. I still love the Victorian and early 20th century Bohemian influences and have kept those percolating through my design imagination, but then something else crept in, something I wasn’t expecting. This early 70s witchy woman muse showed up, with her hand forged boldness and her raw stones. This is primal stuff– the first memories of adornment are of this crazy ankh necklace made of railroad nails which my mother wore. The thing looked dangerous and puzzling, a powerful piece! So I’m on a journey back to my roots. I have always loved wire wrapped links, and as my designs have progressed they have formed the basis of almost all my pieces. Now I have explored using different metals, pickling them in various solutions, hammering and bending. The deliberation of a simple metal spiral reminds me of binding spells and of the Celtic and Viking adornment which is very much of the place where I live now, its ancient history. Things are changing. There is more of me in this new work– more of my hand, my heart and will. I hope you will come with me on this journey. It’s Black Friday. Don’t go down to the maul. Spend it with me instead, supporting small businesses and handmades. I never liked Black Friday very much–the crush at the till, the mania for some consumer item I’d never heard of. Initially it was with a pang of guilt that I indulged in this, the blackest of promotions. But then I realized that I actually enjoyed shopping on Etsy and on other small business owned websites for gifts and treats for myself, and I actually started to look for coupons or sales on this day, allowing myself the luxury of a bit of a spree– something I almost never do. This would not have been possible without the internet, and despite some recent issues on Etsy with resellers, Etsy’s business manuals and the nitty-gritty update emails have been invaluable to me during this very busy time. It’s black, it’s Friday, and there’s a sale on in my shop— what’s not to love? At the On the Edge Festival, Leeds. July 23, 2012 by Feral StrumpetLeave a Comment on At the On the Edge Festival, Leeds. 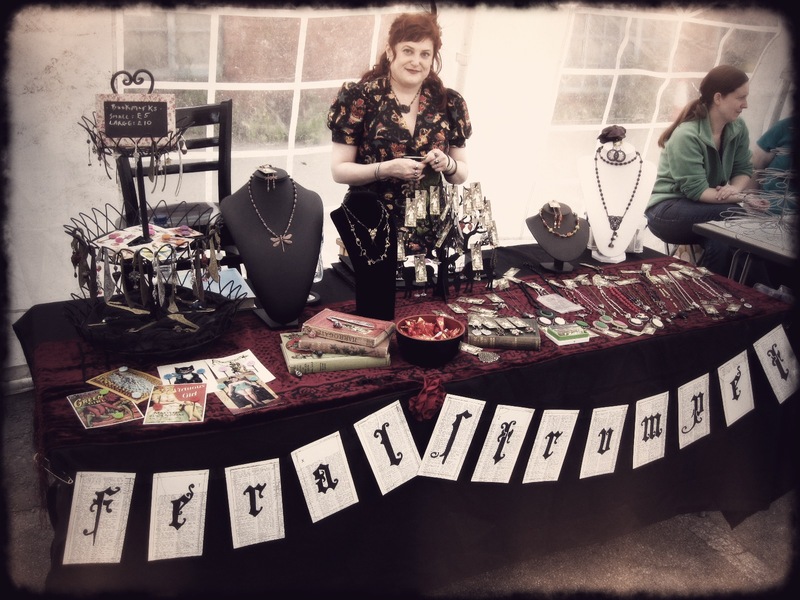 TLast weekend the Feral Strumpet stall was in action at the On the Edge Festival in Leeds. 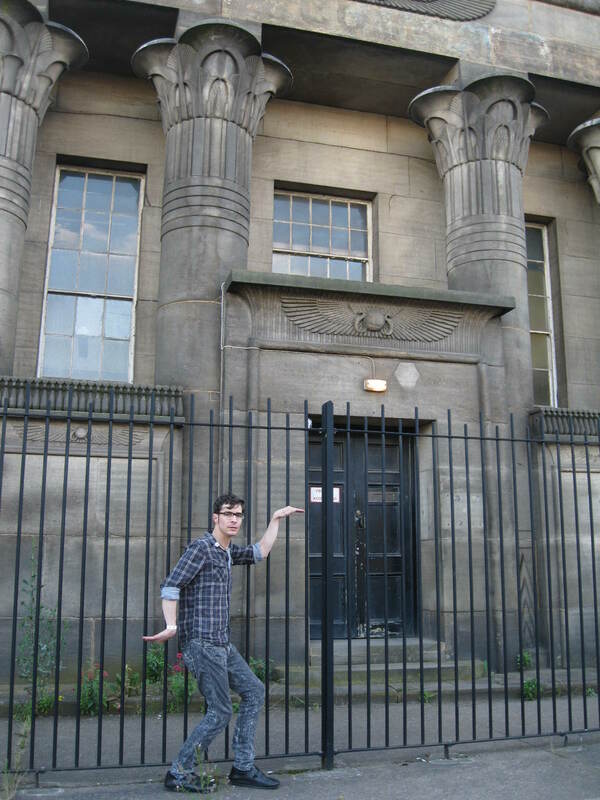 This new arts fest was held at Templeworks, an artspace in the old flax mill, which was designed to resemble the temple of Horus in Edfu, Egypt and built at the height of the industrial revolution in Leeds. Famous at one time for “the largest room in the world” an the sheep which grazed on the roof. It was a pleasure to sell at this festival, as we were blessed with the sun on that day and everyone was in a lazy Sunday mood. The Feral wares were well received and we enjoyed the other traders, all DIY peeps. Vegan food from That Old Chestnut was a highlight. 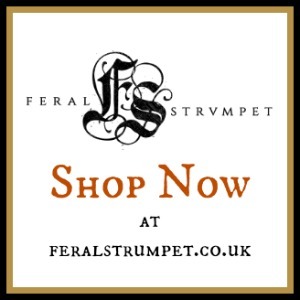 The Feral Strumpet banner was made by installation artist Edith Abeyta. I have no plans to sell at another live event in the near future, but you can still shop at my Etsy store. My faithful helper indulging in some end-of-the-day tomfoolery.